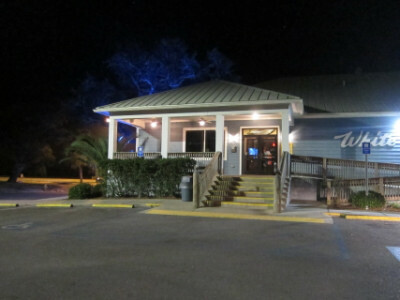 I learned that White Cap is one of the oldest restaurants in the Gulfport area, and that it has relocated twice due to being knocked out by hurricanes. The latest one was Katrina in 2005, and the owners had to display great hope and optimism just to reopen after the great devastation when so many other businesses and residents have not continued in the area. At first I wondered if I had made a mistake in coming here when I found out the fried shrimp was not freshly caught. 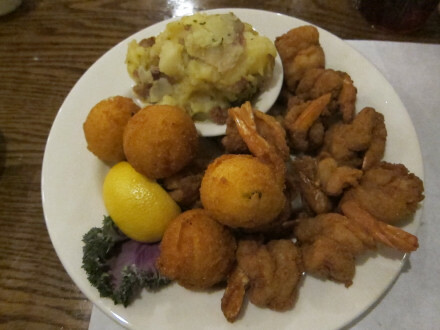 It seems that almost all of the restaurants in the area serve fried shrimp that has been frozen, based on information I heard from a local source (the exception is apparently Steve’s Marina Restaurant in Long Beach). I found out, though, that there are other seafood dishes much better than fried shrimp which are freshly caught, and that these are the favorites with locals. I was a little disappointed by the situation with the fried shrimp, but it was definitely offset by the other food which is served here. 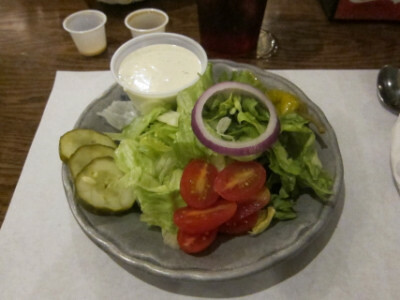 I did not come to the coast to eat salad, but one person in my dining party ordered it so I am including the photo. 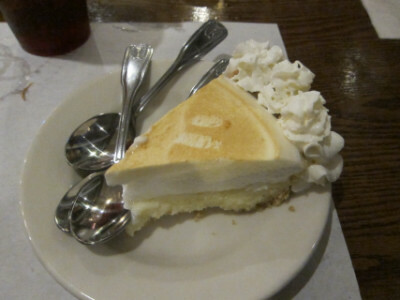 It was said to be very good (and I noticed there was no cheese on top of it, which to me is definitely a good thing!). 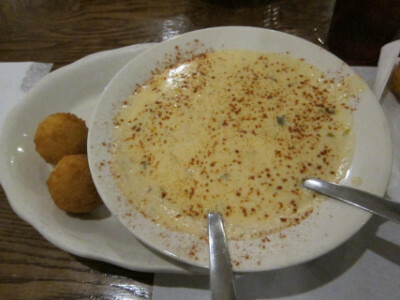 One item I tried, though, was the Crawfish and Corn Bisque. This had a cheese flavor with very good crawfish, and is one of the reasons I think White Cap is a worthy place to try (notice that I am not totally opposed to cheese, it just needs to be used appropriately). The Gumbo was not quite as impressive as some that I tried, but every recipe is different and I enjoyed the one here. 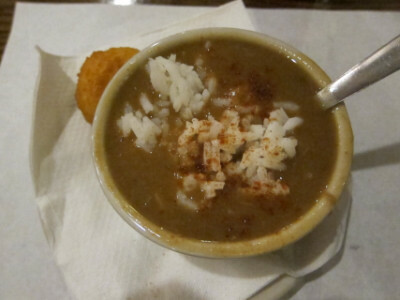 It had a dark roux, several types of meat, and did not have an excessive amount of spices (nothing at all to complain about but perhaps the crawfish bisque is better). We ordered the Fried Shrimp after being told that it was not freshly caught, and I enjoyed it for what it was without feeling that we were victims of unrealistic expectations. My advice, though, is to possibly get fried shrimp as an appetizer but not a main course (the one pictured is a main course). I also need to mention that the Hushpuppies were a real disappointment to me. This is one Southern food that was common in Oklahoma when I was growing up there, and based on this I thought the ones at White Cap fell short. 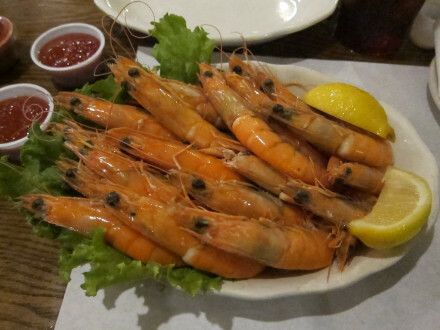 The Boiled Shrimp was definitely the standout item I tried at the restaurant. They obviously use the freshest and best quality shrimp possible, and this clearly rates as one of those meals that I enjoyed a lot more than I thought was going to be the case. There can be too much of a good thing, and even though I shared the plate there was still way too much for us (I don’t know if we misunderstood how big the serving was or if this was all that was available at dinner time, but I would have been very happy with a serving about half this size). I was lucky that I went with a person who knew the local food because I probably would not have tried the boiled shrimp on my own, but this was definitely what I will remember from my trip here. I did not have a chance to try other restaurants in the area, but it definitely seems that White Cap is one of the restaurants trying to maintain its quality for repeat customers (and is definitely not a tourist trap). When I changed my expectations from wanting fried shrimp to being open to try the boiled shrimp, this was definitely a very enjoyable experience. Although I went at night when I could not enjoy the seaside view it did not matter (the food was worth the money without this “bonus”).